When Krishna Priya didi met Gurudeva for the first time, she knew she had met her very best friend. Some time after I received Harinama from Gurudeva, I realized I was scared of him. It took me a couple of month where I meditated on this, because it seemed so strange to be scared of Gurudeva. It made no sense. Then the understanding blossomed. I was scared of Gurudeva because somewhere deep in me I understood he could take away my material desires, and I didn’t want him to. I wanted both, spiritual progress and to keep my material life. Now I understand better. I know that material desires aren’t ripped away from us, but slowly our interest in it vanish like cloudbanks in the sun. During the debate about what rasa Srila Prabhupada has, I can’t say I was surprised about peoples reaction. It took me some time as well, to figure and work it out, but I genuinely wanted to understand the issue. I recognized that the jaladuta prayer showed sakhya rasa and so did everybody else, they just didn’t want to accept it. So the debate waged, and it became slowly clear to me who followed siddhanta and who didn’t. The philosophy wasn’t easy so I had full understanding that people struggled and didn’t accept the other party. We just had confirmation by direct family members of Srila Gurudeva visiting our Krsna-Balarama asram that the fantastic stories told by Premananda dasa about Gurudeva’s childhood in his so-called biography are just that: stories without any basis: the dream of Gurudeva’s parents before his birth, his schoolmate bitten by a snake then brought back to life, the horse and the yogi, etc…All false, bogus, fabricated, No one in Tiwaripur ever heard about this! But in the case of Premananda Prabhu, it’s pretty clear. It doesn’t take much thinking or research or anything really to understand that there is things in his stories that doesn’t add up. Still, people seem to not even read or accept it. They have put their faith one place and ask no question and instead rather harshly disagrees with anything that say otherwise. I understand their position as Gurudeva has also said some very wonderful things about Premananda Prabhu, but one still have to deal with what doesn’t add up as well. It has baffled me. I don’t understand this position, and that might be a good thing. But what does it tell me? That people want to be cheated? That even those who do so much service, isn’t really serious about Krishna consciousness? In one sense I know this doesn’t matter at all, because the only one I can take care of is myself. I have to guard the seed my Gurudeva placed in me and make sure that the water it receives is genuine. But I always try to understand things. It’s like I can’t let things go until I have understood it and all aspects of it even when it lights up issues I don’t like about myself. I don’t understand people. They baffle me. I’m getting the impression that most devotees from Gurudeva’s sanga want to be cheated. I don’t understand it. That great souls cheat others may be astonishing to know, but it is a fact that great souls cheat others for a great cause. It is said that Lord Krishna also advised Yudhishthira to tell a lie before Dronacharya, and it was also for a great cause. The Lord wanted it, and therefore it was a great cause. Satisfaction of the Lord is the criterion of one who is bona fide, and the highest perfection of life is to satisfy the Lord by one’s occupational duty. That is the verdict of Gita and Bhagavatam. . . .
To satisfy the Lord, anything is good, for it is in relation with the Absolute Truth. We also had the same opportunity to cheat the family members and leave home to engage in the service of Shrimad-Bhagavatam. Such cheating was necessary for a great cause, and there is no loss for any party in such transcendental fraud. Do you think Krishna limits his lila to only the spiritual world? If the answer to that is no, then it shouldn’t be hard to envision that may be these debates is part of Krishnas lila and part of the fun is to see how devotees navigate it. May be the people involved are playing the part Krishna wants them to have. Even better, may be Krishna finds just the right persons to play the part He wants and then makes things available to them until they just have to do something. Srila Gurudeva: I brought you from Navadvipa in your childhood. You must look after all my ghara-bhara (temples and the load of responsibility of my mission). They all came after you. They are all preaching and so forth. You have left your responsibilities, why? Don’t give up anything. As it was before, it shall continue the same. Don’t be indifferent. I am depending upon you for all my mathas, temples, and preaching; everything is your responsibility. Therefore, look after everything. As before, take up the burden, and carry everyone forward with you. Sripada Bhaktivedanta Madhava Maharaja: Less people, bhai, not so much crowd. Srila Gurudeva: I am depending on you for everything. But you have given it up. Now carry on. Everything depends on you. One time I asked Srila Gurudeva in Hawaii, in 2005, that, ‘People say you criticize Premananda Prabhu by saying he speaks from the Premananda Purana, why do they say that?’ Srila Gurudeva replied, “They can never understand my relationship with him, not in a million births; he is my heart.” Another time he told me to always serve him. This is just another one of the countless fabricated stories which Srila Gurudeva would often refer to as the ”Premananda Purana”. … remember repeatedly hearing Srila Gurudeva interrupt different sannyasis while they were speaking hari-katha, asking them what was the source for what they were telling. When those sannyasis answered, ”Premananda prabhu”, Srila Gurudeva would dismiss it with, ”Oh! The ‘Premananda Purana’.” He even repeatedly slapped in private one of them, for having spoken during class unbona fide things he had heard from Premananda dasa, strongly rebuking him,” He is making you crazy! Hearing from him is ruining your life!” Sripad Bv Madhava Maharaja told that sannyasi afterwards that he had not seen Srila Gurudeva that much angry in twenty years. Srila Gurudeva asked Premananda dasa why he was always making up stories. Premananda dasa answered that lying was a compulsive habit that he had developed and couldn’t get rid of. So apparantly we have a contradiction. In one sense we have a person that Gurudeva glorifies and chastised at the same time. We have a person who is doing so much wonderful seva and especially the building of Gurudevas seva which went from nothing to a wonderful samadhi since he took over the project. But then we have many accounts of untruths coming from him. It’s so huge contradictions both in the statements of Gurudeva and in his service that it’s enough to baffle. This account by Yadubar Dasa Leyte is very interesting, because here Premananda Prabhu specifically reveal that many devotees who come to him doesn’t or can’t follow Gurudeva. May be Premananda Prabhu is playing a part that Krishna wanted him to take. It takes a very special person to take on such a role. It might also explain why there seem to be such apparent contradictions in the behaviour, accounts and service of Premananda Prabhu. We can’t always understand why Krishna do what He does, but by creating some disturbances He gives the opportunity to discover it. This is Krishna lila and if Krishna create these disturbances, how can we speak about Vaishnava aparadha if Krishna is the real puppetmaster behind this? After Suddhadvaiti Maharajas post about Premananda Prabhu, it’s been nice to see how his disciples defend their Guru and how this encourage their guru-bhakti. However, there is one thing that needs to be addressed in their eagerness to defend their Guru. There is a difference between the current disagreement and what rasa Srila Prabhupada has. This debate is a question of trustworthiness which is key in our spiritual process and who we seek siksa from. The rasa of Srila Prabhupada is a discussion on siddhanta – it’s a siddhantic disagreement and therefore need to be understood differently. Question by Krishna Karunya dasa: Most of our guru varga we know like Prabhupada Bhaktisiddhanta is Nayana Mani Manjari, Vinod Manjari Paramgurudeva, Bhaktivinod Thakur is kamal Manjari, Gurudeva Raman Manjari. Now people are asking what is Swami Maharaja´s siddha svarup name, like there is nothing revealed, so now they are raising this question saying he is a sakha. First you realize your svarupa, then you are not fighting. First svarupa siddhi, then vastu siddhi. New___?___ bhajan, respect giving, then you will watch your siddha svarupa and then you will watch Swami Maharaja´s svarupa, and all the jiva´s svarupa you will understand. Why are they fighting? This is demon’s fight, demoniac philosophy. Now this fight is like that of dogs; one on one side and another in other side. “Hey I am the dog king. This is my line, my area. Why are you entering my area? Then barking, barking barking, then biting, cutting and killing and not giving any entrance; “this is MY area.” “My understanding this is all in all.” Who is telling this? Nonsense people. Mahaprabhu what is He giving? Is Mahaprabhu distributing sakhya rasa? Nityananda prabhu what is He giving? 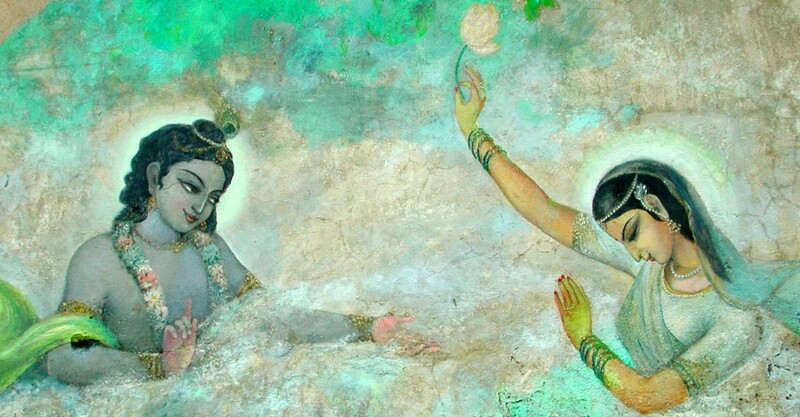 Nitai pada kamale, Radha Krishna paite nai. When Advaita Prabhu is dancing how long does he have this gopi mood? How long time? You read Chaitanya Bhagavat. So then? Everybody in this sampradaya have NO other mood, not possible. The priyanarma-sakhas are superior in every way to the three other types of sakhas. They are engaged in extremely confidential services and are possessed of a very special bhava (sakhi-bhava). In other words they perform confidential services for the preyasis (lovers) of Sri Krishna, they assist Krishna in meeting with the preyasis and they desire to give pleasure to them. These include Subala, Arjuna, Gandharva, Vasanta, Ujjvala and Madhuma∫gala. Of these Subala and Ujjvala are the best. We have to follow Gurudevas words and as I show above even he emphasizes the sakhi-bhava of priya-narma sakhas. The majority of Srila Gurudevas sanga who don’t accept the speciality of priya-narma sakhas is blatantly disregarding Gurudevas siddhanta and it shows how they haven’t deeply looked into this issue. There is also the case of Gour Govinda Maharajs alleged statements on the rasa of Srila Prabhupada which has been refuted. I understand that the disciples of Premananda Prabhu defends the character of Premananda Prabhu and they do it well, but in their defense they should refrain from mentioning the siddhantic debate of rasa-vicara of Srila Prabhupada and use it as an example. I can appreciate it if people do not immediately accept everything that Prabhji says in his class. … Gurudeva quite clearly said that we should always look to the scriptures to confirm things and he also said on a number of occasions that Prabhji’s class is nonsense so I can understand why people are frustrated with him. … In regard to Gour Govinda Maharaj he was present in Keshavji Gaudiya Math when he first arrived there and so is in a much better position than our dear friend or any other biographer to reveal what actually happened on that occasion. Why hadn’t he spoken about this before? Well why should he when he knows this is the reaction he will get? Then he comes with arguments on how to recognize Guru and how Premananda Prabhu fits that description. While most goes into the emotional defense of Premananda Prabhu, Subal Sakha addresses the inconsistencies that are brought forward and how he navigate them. A Gurus word should be in line with sastra, and when there is inconsistencies, we need to meditate on how to navigate it. We need to understand our opponents arguments and see if there is some validity to each and every one of the arguments. If you find one such inconsistency, what does it mean for you? For example, in the debate of the rasa of Srila Prabhupada there is one inconsistency of KBM which has not been addressed by them. This was an inconsistency where I had to think on the implications of it and how I would navigate this internally. Only a fool would easily discard ones Guru or those he seeks guidance from. But we do have to deeply look into the arguments and inconsistencies that are pointed out to us. It’s an opportunity for learning. Here is the letter by Bhaktivedanta Suddhadvaiti Swami in regards to Premananda Prabhu which Bhaktivedanta Suddhadvaiti Swami allowed me to publish. I will not comment so much on the contents or the responses so much (at least not now though I may say something on a later point). So how to approach this? The backbone of all devotees no matter what we believe is that they speak the truth, especially sannyasis who have been at it for decades. At the same time, we are human with faults. That BV Suddhadvaiti Swami allowed me to publish the letter shows that he fully supports his statement. Premananda Prabhu has done wonders with the construction of Gurudevas samadhi and it seems like BV Suddhadvaiti Swami recognizes this since he writes he don’t want to minimize his other services. This is an important distinction. When you have kids, there is a certain way to raise them when they do something wrong. You criticize their acts, but not the kid itself. The kid isn’t good/bad/etc because he did something wrong, but their one act may be unkind. This is the approach I try to take when I open my big mouth. But of course, when devotees clash then the act itself and wether it has happened is in question itself. We have to use our intelligence, and use it wisely. We are speaking about our spiritual welfare, and I know that my spiritual welfare is so important that I have to guard the seed that Gurudeva planted in me. We have to make up our own mind. For me this means that I don’t shy away from those hard questions or conflicts, but I enter them with an intent to increase my understanding – wherever and however it approaches me. I don’t need to classify people as good or bad, but I do need to increase my understanding of them. I try not to label people, because I usually don’t like that people label me. Labels are uninteresting. Sannyasis always have to stand up for the truth/siddhanta, they have to stay true to their calling even when it’s uncomfortable, even if it means sometimes you have to go after a person. This is about correction between devotees. I don’t see a need for regular devotees like me to become involved in this. We can be on the sideline and observe, making some reflections that can help us spiritually. Observe and reflect with an equal mind. A new issue seem to brewing in the sangha, and this time it seems like an article by Suddhadvaiti Swami is in the limelight which comments the biography (Sri Guru Darsana) by Sri Premananda prabhu on Gurudeva. I haven’t found the article itself anywhere, so I wonder what it say. But, on Bhaktabhandava fb page there is two different postings about this. My impression so far is that this seem to be more of a character issue and not connected to siddhanta, at least the two responses gives me that impression. So I’m looking forward to picking up this biography when I go to Vrindavin and reading about my Gurudeva. Premananda Prabhu is the one who managed to get things going in the construction of Gurudevas samadhi. Just like after Bhaktisiddhanta Saraswati Thakuras disappearance, we have KBM and Bhaktabhandava who distinguish themselves as … kind of separate mathas. I say kind of because at least on purebhaktis teachers they all are there: KBM, Premananda Prabhu and all the ones with differing views. So.. well. At least spiritual life keeps it interesting for mundanes like me. Bhakti is awakened when one associates with bhaktas of Sri Bhagavan. Association with suddha-bhaktas is attained only by the accumulation of transcendental pious activities performed over many lifetimes. I used to be a part of Science of Identity Foundation through some polish devotees who was preaching here in Norway. At some point I was thinking that I should find myself a Guru, and of course Siddhaswarupananda Paramahamsa was the one who came up. He was the only one I knew of. So I prayed hard, because I wanted the real deal. I wanted a pure devotee and nothing less. A couple of months later some devotees of Gurudeva came to Norway and the rest is history. When the debate of Srila Prabhupadas rasa emerged, it took some time for me before I understood that KBM was actually the place I had stayed at when I was in Vrindavin the last time (I think it was 2005). I was very covered then, so I didn’t really recognize how fortunate I was to be staying there. During my stay there in 2005 I had a dream. I was sitting with some other devotees before Srila Gurudeva who was talking/lecturing (I didn’t see Gurudeva in my dream). I suddenly saw Krishnapriya didi and Madhusudhana Maharaja amongst these devotees. Then they saw me and put their heads together and said something to each other. Then I left that dream. When I woke up I thought the dream was a bit weird. I was staying at KBM, so why did I see them in my dreams (and not Gurudeva)? I didn’t think much of it, and it took even a longer time before I remembered this dream after the debate occurred. The debate itself I now see as a test of our sincerity and may be as an indication of where we can turn for siksa. For someone like me, it’s essential that I have high class association. Nothing less is acceptable for me. I have this one life, it’s too precious to waste. In an unexpected turn of events I have purchased plain tickets to Delhi for Christmas and will go to Vrindavin and visit KBM. Suddenly the dream I had comes forward in an unexpected way. May be this was Gurudevas way of telling me where my community were – but I wouldn’t understand it until 10 years later? My be the dream told me where I should go for siksa? I’m so, so, so looking forward to this. Finally! Finally I will be under guidance again? I sure need it. And being in Vrindavin again will be amazing. I’m coming home. I used to follow ekadasi many years ago. I always dreaded it, knowing it would be a day I was working while being hungry, having a splitting headache, being cold, tired and fantasizing on all I couldn’t eat. Who wants that? Not surprisingly I haven’t followed ekadasi for years. So I don’t know why I suddenly thought that I should try it again, but it might be because I had some of what I could eat already thought of. So this time I went into it not really thinking much of it. Relaxed. Breakfast was to be creamy buckwheat with fruits and nuts. A little research gave me what looked like a delicious broccoli soup and for dinner just potatoes in cream sauce. I ended up only eating breakfast and dinner, and was satisfied with that. I had a headache from the morning until I couldn’t get to sleep because of the headache. Still, I was fine. A little headache is only a minor inconvenience and I can still function as before. I wasn’t hungry, but more importantly, no day dreaming on what I couldn’t do. I was content. The next day came and I checked when to break the fast, it was too early so I waited. No big deal. Except – the whole experience was a big deal to me. From really struggling with ekadasi, I suddenly had no problems whatsoever. This was effortless. The mind gave me no troubles whatsoever. Though, the mind is a different entity now from when I followed ekadasi years ago. So again, this shows progress to me. An unexpected progress that I hadn’t really been aware of, but it’s still huge. It’s huge because for the first time, the tongue gave me no troubles, the mind gave me no troubles and the body is just not used to fasting. How wonderfully exciting! Usually I can only spot progress when I think a year back in time etc. but this time it came forward differently. And with my eating habits as well, which is something I have been wanting for so long. I will see if this is something that sticks, but experience is that when things is effortless it usually fixes itself. What made this time different? Usually I have been a stickler for following rules, but now I don’t care much for them. I have always looked a bit askance at the rules enforced at purebhakti.com. I understand grains, but why broccoli, cauliflower, leafy greens etc? What is the real purpose behind them? I kind of get the feeling it’s just so strict to force us westerners to stay off the food and dedicate the day to bhajana. Though me thinking like this might be against Gurudevas instructions, so I become a bit apprehensive. But really, is there a purpose against tomatoes, broccoli etc? I mean, look at the length of the list of what you can’t eat. Then look at the length of what you can eat. When I see something like that I automatically think this is just ridiculous and a distraction from what the heart of the matter is. Ekadasi is for bhajana and the fasting is a vehicle to progress spiritually. Ideally, I would only drink water and may be some fruits, but my body and mind is just not ready for that. Give it time and practice and this will change. What do you think about the ekadasi fasting rules? What should be permitted for somebody who isn’t able to follow the strictest regime (and what should be the strictest)? After the passing of Srila Bhaktisiddhanta Saraswati Thakura (BSST), there was a breakup of the Gaudiya matha. As a result, most of the sannyasis established their own mathas. In the 1950, A.C. Bhaktivedanta Swami Prabhupada and Bhakti Prajnana Keshava Maharaja wrote and published article on the breakup, the first in a series. Such a hue and cry of protest arose from the mass of devotees arose that they decided not to publish further articles on the matter. Bhakti Prajnana Keshava Maharaja was certainly in a position to know all the details firsthand, having at one time been falsely accused of murder and arrested along with his entire Math. Can a breakup of a matha be favorable? If so, how? It happened after BSST, and now that Krishna Balarama Mandira has been banned from preaching in America, are we seeing the contours of the same happening now? Are the organization (ipbsys) that was put in place fractioning up? There have been several challenging issues that have arisen since Gurudevas disappearance. It’s the falldown of one of the sannyasis, that one sannyasi took on babaji vesa and now the debate on what rasa Srila Prabhupada has. And those are only the ones I know about. I have also noticed something curious about myself. I try to follow those who have been within the matha for a long time, and I have followed more closely the arguments of those favoring madhurya-bhava than I have KBM. But I can also say that now that the dust has settled and I still follow them, I find myself less interested. When I see what they quote of Gurudeva, I think “This is just low levels of vaidhi-bhakti”. Why are they quoting this? Is this an indication of where they are? So I become disinterested because I see that whatever vitality I’m searching for is not there. I have preached the middle ground and I see no reason to harbor any animosity. On the contrary, I think we all can do a great, nice kirtan together. But yet, I want vitality with my harikatha. I may not think Nemi Maharaja have digged enough into his own arguments, but I fully respect that he keeps on digging. That shows me vitality in action. I want him to keep on digging, and I will keep on listening because his digging encourage me to keep on working on my own understanding. Syamananda prabhu emails me regularly with something interesting he wants to show me. Often I find myself empty, but then he mails me something that prods me back. This is vitality. KBM challenged me with their statements. This is devotees who keep on challenging me and I need it. But I just don’t understand how a split can be favorable. If we take the devotees that have been a part of Gurudevas sanga for years which I now may have come a little less interested in. They have done more service than I ever will. They are more advanced than I ever will be. Many have sought the guidance of Bhakti Vijan Bharati Maharaja which from my understanding is a pure devotee. I have the utmost respect for them. So what am I missing? Damodar Maharaja said to Gurudeva “You are making so many plans for the future, but you never say who will come after you. Who will be the Guru? Acarya? But if you don’t appoint an acarya, they all will become acarya and they will all fight amongst each other and everything will be burnt to ashes. I can’t for the life of me understand the benefits of a breakup. I just don’t understand it. If we take the madhurya-rati side it seems like they keep themselves connected. What positive side effects does a breakup have? I understand that people are different and this translates to devotees as well. During the trips I’ve had to festivals there was only a very select few I really connected to and those devotees shine bright for me. The rest I avoided which pretty much made up most of the devotees. But this spiritual path is not a popularity contest. It’s not about who’s in and who’s not. This spiritual path is for everybody. So what is achieved by a breakup? Gurudeva gave the response “Very good” when Damodar Maharaja said that everything will be burnt to ashes if he didn’t select a successor acarya. This indicates that a breakup can be good. By dividing, Krishna can achieve something. But what? For the record, I don’t hold any opinions on this matter myself (at least not now). I just like the philosophical understanding that can come of this.